A scold's bridle, sometimes called a branks, was a punishment device for women, also used as a mild form of torture. 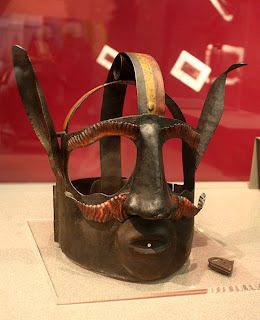 It was an iron muzzle or cage for the head with an iron curb-plate projecting into the mouth and pressing down on top of the tongue. The "curb-plate" was frequently studded with spikes, so that if the tongue remained lying calmly in place, it inflicted a minimum of pain. And that's just a sampling. Women in history have been bound, gagged, imprisoned, dunked and drowned for public speaking. Read chapter 4 of Jamieson's Eloquence in an Electronic Age for a good, focused review of the history of women's speaking--and why it is so short. Or as she says: "History has many themes. One of them is that women should be quiet." In Women's History Month, what does this bit of history make you think about women and public speaking--and your own speaking?